Cleantech One is a 37,500 sq.m. BCA GreenMark Platinum certified Industrial building. It is a Jurong Town Corporation project that is part of the larger Cleantech Park, which is a 50 hectare site for clean technology activities such as R&D, test-bedding, prototyping. 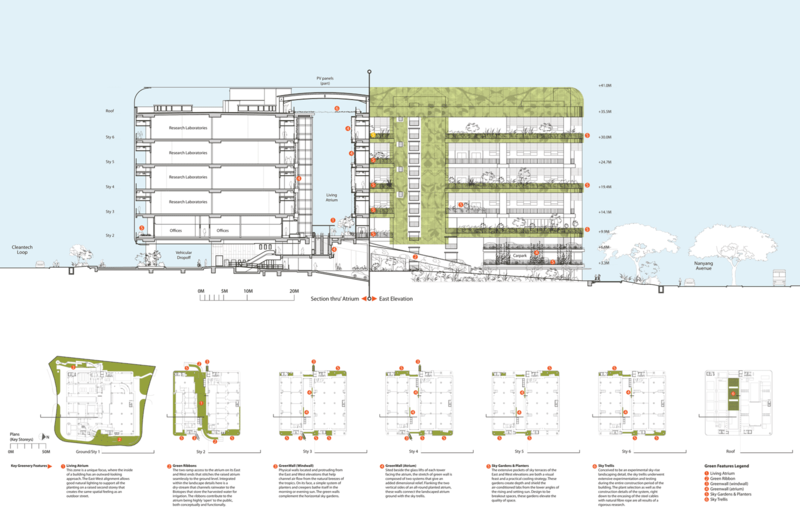 Cleantech One employs state-of-the-art Active technology features, but also integrates Passive design catering to its Climatic context (Singapore). Singapore has a tropical rainforest climate, with temperatures rarely straying from 29-30 degrees Celsius. Humidity stays high throughout the year and there is regular and heavy precipitation. The effect of temperature can be reduced by strategic shading measures. Cleantech One uses proper orientation, green walls, planters, sky trellis. Humidity is addressed by increasing air movement to provide potential relief to occupants as seen below. These measures reduce dependence on mechanical cooling and thus help decrease Energy costs. The plan of Cleantech One has 2 large blocks with a semi-open atrium space between them (as seen in the Plan diagram below). This makes horizontal air movement possible through the canyon like space, thus increasing thermal comfort for the surrounding areas. The breathing atrium continues vertically upwards (as seen in the Section diagram below), providing cross ventilation as well as natural light to abutting areas on all floors. The unit thick principle is a design feature applied by WOHA Architects, Singapore in many of their projects. According to it, the width of building blocks needs to be narrow enough for sufficient usable daylight to enter from either side. This design also allows good natural ventilation. In the case of Cleantech One however, the blocks have wide footprints to incorporate industrial functions such as research laboratories. This large width prevents proper application of the Unit thick principle. Thus, Breathability addressed mainly by using an Atrium, provides natural ventilation. This increases thermal comfort, reducing the amount of mechanical cooling required. The air movement also helps dissipate heat, thus positively affecting the micro-climate. The Atrium has reflective glazing panels (a) that bounce light. This enhances the usable daylight, decreasing the need for artificial lighting. The building tries to integrate with its environment, so as to cause minimal disturbance to the existing serene surroundings. The landscaping both Vertical and Horizontal uses native plant and tree species, that are irrigated by harvested rainwater. Green walls protrude on the east and west facades as ‘Windwalls’ to channel tropical breeze into the building. Green walls on the inside vertical faces of the atrium, connect the Living Atrium floor plane with the sky trellis. The ‘Living atrium’ is located at the raised second storey level. It is joined by 2 ramps or ‘Green Ribbons’ that grant access from east and west ground levels. The atrium also forms an inclusive semi-outdoor space with a cafe, seating spill-out and informal meeting area. There is a dry-stream channeling rainwater to the biotopes that store harvested water used for irrigation. The east and west facades are always difficult to shade, due to low-angles of the sun’s rays. Sky gardens and planters on these facades help cool the labs and create pleasant breakout spaces. An experimental landscaped Sky Trellis is located below the atrium roof, hung using steel cables encased in natural fiber rope. The trellis doubles up as a shading device. This integration with Green and Blue creates a cooling effect, that further contributes to lowering energy loads; while also positively affecting the micro-climate and occupant wellness. Let’s look at other leading questions that arise after looking at our example of Cleantech One. We will raise objective issues and hope to address them as we move ahead. This will enable us to look at the problem from all angles and find logical solutions. Q) Integration with Green has positive effects on micro-climate and energy loads. However, landscaping has associated water and maintenance costs. There are also issues of insects that may not always be welcome in an urban/ strictly controlled setting like that of laboratories. What do you think about this? Q) Architectural programs with large footprints like Industrial buildings, may not always be able to include passive principles such as natural ventilation and daylight. Cleantech One shows us ways around this problem, with the use of a through and through Atrium. Do you know of other solutions / projects with similar constraints and innovative solutions? As always, please let us know your thoughts, suggestions, queries, opinions. Your views will make this exploration richer!